Eugenol Oil Overdose is the accidental or intentional intake of the compound in dosage higher than the recommended values. What is Eugenol Oil Overdose? Eugenol Oil Overdose is also referred to as Clove Oil Overdose. What are the Causes of Eugenol Oil Overdose? What are the Signs and Symptoms of Eugenol Oil Overdose? The signs and symptoms of Eugenol Oil Overdose can vary from one individual to another. It may be mild in some and severe in others. Several systems of the body, such as the digestive system, nervous system, vascular system, urinary system, and ENT may be affected. How is First Aid administered for Eugenol Oil Overdose? Who should administer First Aid for Eugenol Oil Overdose? 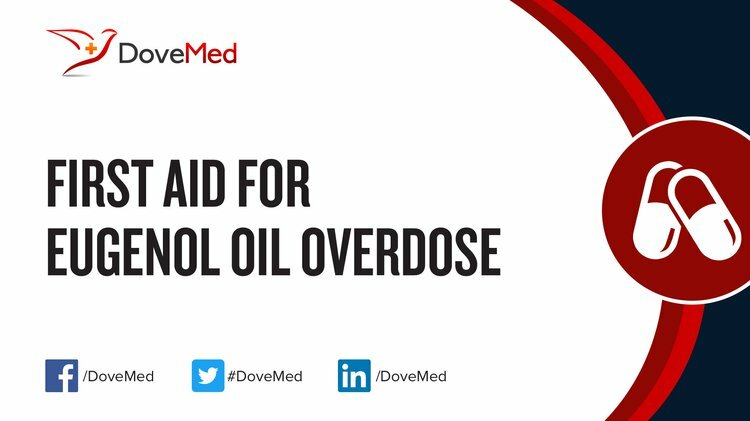 First aid for Eugenol Oil Overdose is administered by healthcare professionals. What is the Prognosis of Eugenol Oil Overdose? How can Eugenol Oil Overdose be Prevented? Garkal, D. J., Taralkar, S. V., Kulkarni, P., Jagtap, S., & Nagawade, A. (2012). Kinetic model for extraction of eugenol from leaves of ocimum sanctum linn (Tulsi). International Journal of Pharmaceutical Applications, 3(1), 267-270. Southwell, I. A., Russell, M. F., & Davies, N. W. (2011). Detecting traces of methyl eugenol in essential oils: tea tree oil, a case study. Flavour and fragrance journal, 26(5), 336-340. Kamatou, G. P., Vermaak, I., & Viljoen, A. M. (2012). Eugenol—from the remote Maluku Islands to the international market place: a review of a remarkable and versatile molecule. Molecules, 17(6), 6953-6981. Yao, Z., Namkung, W., Ko, E. A., Park, J., Tradtrantip, L., & Verkman, A. S. (2012). Fractionation of a herbal antidiarrheal medicine reveals eugenol as an inhibitor of Ca 2+-activated Cl− channel TMEM16A. PloS one, 7(5), e38030. Oates, L. (2014). Complementary medicines for oral health. Australian Pharmacist, 33(1), 50. Vatanparast, J., Khalili, S., & Naseh, M. (2017). Dual effects of eugenol on the neuronal excitability: An in vitro study. Neurotoxicology, 58, 84-91. Sasikala, A. (2012). Biotransformation of eugenol and isoeugenol to vanillin by Aspergillus Niger.